The Cleveland Indians had a new face at third base on Opening Day. It was their No. 10 prospect Yandy Diaz, a Cuban defector whose road to the majors was not easy. Opening Day lineups are usually filled with stars, shiny new free agent signings and big time prospects that fans are anxious to see. The Cleveland Indians showed off their new signing Edwin Encarnacion, who hit a game-tying home run. They showed off their established stars, Francisco Lindor and Corey Kluber. There was one player making his MLB debut. It wasn’t one of their star prospects Bradley Zimmer or Francisco Mejia, however. It was their No. 10 prospect (per MLB Pipeline) Yandy Diaz, a Cuban defector who was the International League Rookie of the Year in 2016. 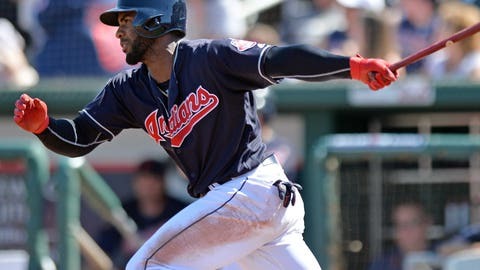 Diaz started at third base in the Indians’ Opening Day win over the Rangers. He won the battle for the third base job over Giovanny Urshela after an incredible spring in which he hit .458 with two home runs and 15 runs batted in over a span of 48 at bats. His major league debut was a promising one, as he went 1-4 and scored once. He even made a spectacular play in the field and looked comfortable at the hot corner. While Diaz has showed he is a gifted athlete, he has had a long road to get to where is now. In 2013 the Indians signed Diaz and gave him a $300,000 signing bonus, which was a low-risk move for how expensive international free agents have become. Diaz defected from Cuba to pursue his career in baseball. He had attempted to escape from Cuba twice before, only to be put in jail for 21 days after each attempt. He was able to get on a raft the third time with his friend Leandro Linares, another current Indians prospect. They made it to the Dominican Republic safely 12 hours later. Since coming to the United States, he has played well in the minors. Diaz is a career .307 hitter over his three minor league seasons, making stops with Advanced A Carolina, Double-A Akron and Triple-A Columbus. He has shown signs of being a plus defender during his time on the farm to go with his ability to hit for average with some pop in his bat. He has some speed, stealing 11 bases in 2016. Diaz has made improvements each season, as he goes from level to level steadily. His offensive numbers have improved each season even with the promotions to higher levels. He finally got the call-up to make his MLB debut when he was promoted from Columbus on April 2. Beating out players with MLB experience to start on Opening Day is a sign the Indians see the potential in Diaz. His steady improvements could be a sign he is ready to produce in the majors. While there is no way to predict Diaz’s future for sure, there is a chance he can find himself a regular spot in the Indians lineup in the future. He looked like a poised veteran, minus getting caught looking on a strikeout in his first at bat. A player who hails from a country that is known for producing talent, along with his perseverance to leave for a better opportunity and finally get his shot to live his dream of becoming a major leaguer, has the chance to be successful. There will always be things a player can work on, however. Diaz still has trouble with speaking English, which could make it hard to communicate with coaches on ways to improve. He will also need to prove he can play regularly, which will involve him playing like he did in the minors. That is not always easy, but he has done things much harder with consequences that could have been much worse. Hopefully Diaz can find a way to be an everyday player for the Tribe and incorporate himself into their core of young stars.